Earlier this week, Energy Transfer Partners (ETP) and Chesapeake Energy Marketing, Inc. (a subsidiary of Chesapeake Energy) announced the development of a new pipeline serving the Haynesville Play. The new pipeline, dubbed "Tiger Pipeline," will be a 178 mile, 42 inch pipeline that will connect to an existing ETP pipeline in Carthage, TX and will end near Delhi, LA. The pipeline will have initial throughput of 1.25 Bcf per day with the possibility of increased capacity to 2.0 Bcf. I read in the Wall Street Journal today that Shell Oil is increasing its capital budget from $30 million to between $31 and $32 million. While this is not a dramatic uptick, Shell is one of the few E&P companies to increase its capital budget. The company also announced that it is increasing its dividend, a sure sign of confidence. Shell's move comes in the wake of several disappointing announcements from major companies, especially ConocoPhillips, which slashed its capital budget earlier this week. Shell's activity in the Haynesville Play is in the form of a 50/50 joint exploration venture with EnCana Oil & Gas. Southwestern Energy, one of the main players in the Fayetteville Shale, announced last month (press release; link to resentation summarizing the company's operations) that it has increased its capital budget 17.6% to $2 billion. This is a stark contrast to other natural gas E&P companies that have been slashing their capital budgets. Southwestern is able to do this because the company has relatively strong financials and spent 2008 behaving in a prudent manner (i.e. selling some assets during the height of high prices rather than when they were forced to). Southwestern is making a bold statement that it wants to be the leader when the country emerges from this recession. Other gas companies are limited by the fact that the credit markets, upon which they depend to expand their operations, are largely frozen. Investors are pressuring these companies to be more conservative and hoard cash. In my mind the main reason Southwestern is able to do this is that the company did not get caught up in the Haynesville frenzy. Southwestern is big in the Fayetteville and Marcellus Shales but didn't get into NW Louisiana. They have some exposure in East Texas, but it doesn't seem to be at Haynesville depths. This action is not without risk. If the recession deepens or is continues for a long time, Southwestern's spending might be premature. Additionally, much of the investment will require midstream assets (i.e. pipelines) that might have to be provided by companies that are more capital constrained and not able to make the investment in time for the Southwestern investment to pay off. 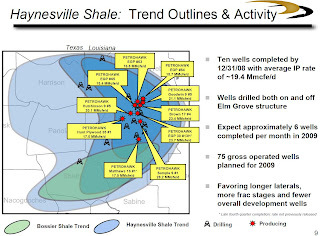 For those with an interest in the Haynesville Play, this is good news/bad news. It's good news to see a company bucking the trend of cutbacks, but it's bad news that it's not a Haynesville company. It's clear that the leasing activities of 2008 have injured some of the Haynesville participants. Done in by their own success. Labels: Capital Budgets, Fayetteville Shale, Haynesville Shale, Marcellus Shale, Southwestern Energy Co.
Petrohawk published a presentation the company made at the recent BMO North American Unconventional Gas conference with lots of good information about the Haynesville Play. There's a good map of the play with the Haynesville and Bossier Plays depicted separately (something that is rarely publicly estimated). Since the presentation was at more of a technical conference there is lots of technical information in the presentation, including very specific data, a stratigraphic column, log samples and core properties. Some of the best information includes a map showing the drilling sites (image above). The presentation states that Petrohawk expects to complete 6 wells per month in 2009 and have 75 completed by the end of the year. I also neglected to mention Questar's November release describing two Haynesville wells. Questar is not the company people first think of in terms of LA/TX exploration, but they have had some under the radar success. From Questar's press release: "The Waerstad #3, located in Red River Parish, LA (Sec 1, T14N, R12W) was placed on production on November 13, 2008 at an initial rate of 16 million cubic feet of natural gas per day (MMcfd) on a 23/64 inch choke with 6,400 pounds per square inch flowing casing pressure. Eight fracture stimulation stages were pumped in the 3,234 foot horizontal lateral. Questar E&P has a 100% working interest in the Waerstad #3 well. The Wiggins 36 H - #1, located in Bienville Parish, LA (Sec 36, T15N, R10W) was placed on production on November 16, 2008, at an initial rate of 7.4 MMcfd on a 22/64 inch choke with 5,450 pounds per square inch flowing casing pressure. Nine fracture stimulation stages were pumped in the 3,455 foot horizontal lateral. Questar E&P has a 62% working interest in the Wiggins 36H- #1 well. Questar E&P is currently drilling two additional company-operated Haynesville horizontal wells and is participating in four outside-operated Haynesville horizontal wells that are in various stages of progress. I neglected to mention GMX Resources' late November announcement of the company's first Haynesville well (they call the field Haynesville/Bossierville because they drill more in Texas where the formation tends to be called Bossierville). From their press release: "The Callison 9H (100% WI) located in the William Smith a21, Harrison County, Texas has the Company's shortest planned lateral of 2,200 feet. The well was placed on production November 20th and is currently producing at a stabilized rate of 7.7 Mmcf/d, on a 22/64" choke with 5,200 pounds flowing casing pressure. The completion consisted of an eight stage fracture treatment. "We have budgeted 2009 based on a beginning production rate of 3.4 Mmcf/d," stated Ken Kenworthy, CEO of the Company. "The Company is currently drilling two H/B horizontal wells. Completion of the Bosh 11H and the Baldwin 17H will take place 1Q09. A fourth H/B horizontal well is expected to spud within two weeks... The next 16 H/B horizontals are expected to average a 3,800 foot lateral and 11-12 stages of fracture treatments." In a later release, GMX noted that the company had cut its capital budget 45% to $220 million. Because of this cutback GMX reduced its expected 2009 Haynesville wells to 27 from 45. "The Company has completed its initial horizontal Haynesville Shale well, the Chesapeake Energy Corporation-operated Holland 17H-1, which tested at a rate of approximately 14.5 MMcf per day on a 24/64 inch choke with 6,000 psi. The well, which was drilled to 16,200 feet, had a horizontal displacement of approximately 4,400 feet (3,800 feet cased), and is located in the Company's Bethany-Longstreet area in Caddo Parish, Louisiana. Goodrich owns a 50% working interest in the well, Chesapeake owns 40% and Plains Exploration & Production Company owns 10%."